Comfort (3.5/5) – The housings of the StageDiver earphones were designed based on an overlay of over 500 ear impression scans. 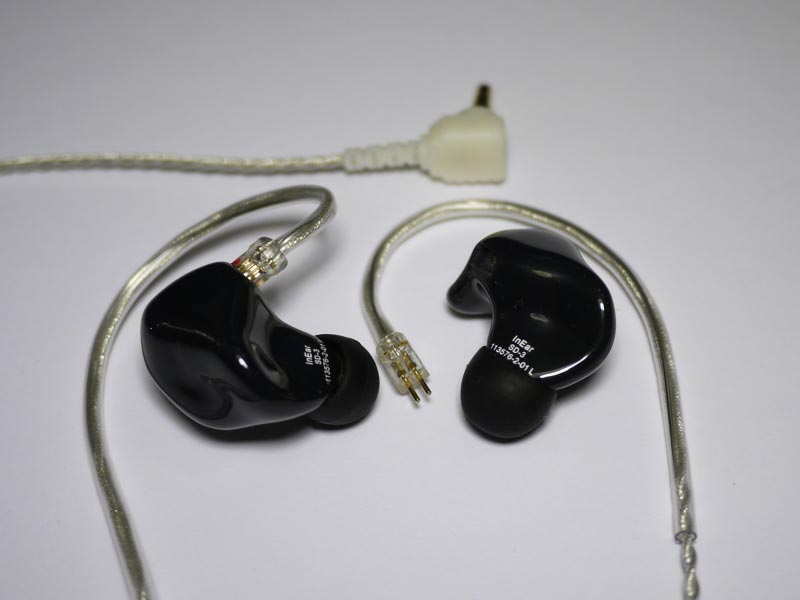 The shape is very unique, even among “universalized” custom in-ears, because the shell extends into upper part of the concha. This provides an extremely secure and stable fit but with smaller ears the concha “fin” can exert some pressure on the ear, so I would recommend trying before buying for those with small ears. Note: a more compact version of the StageDiver 3, the StageDiver 3S, is available as of 2014. More info here. Sound (9.3/10) – The StageDiver 3 uses a 2-way, triple-armature configuration with dual bass drivers. Perhaps not surprising is that it sounds very much like the less expensive SD-2 model except in the bass region, where the SD-3 has significantly more presence. The bass of the SD-3 is enhanced, putting it alongside the likes of the EarSonics SM64 as one of the most bass-heavy BA-based earphones on the market. Bass impact is slightly lower than with the significantly more expensive quad-driver FitEar TG334 but bass control is similarly good. All in all, the SD-3 can compete with many dynamic-driver earphones when it comes to low end power. Extension is excellent as well. The SD-3 is a bass-boosted earphone with a warm tonal character, and while its midrange is not recessed, bass-midrange balance is definitely better on the flatter SD-2. The StageDiver 3 sounds rich and full, though, and offers good note thickness. However, it lacks the midrange forwardness, as well as some of the clarity, of the FitEar TG334 and high-end custom-fit monitors such as the UM Miracle. There is also just a touch of vocal intelligibility lacking compared to sets such as the Etymotic Research ER4S, in part due to the more laid back upper midrange and treble. The top end of the SD-3, maintains a good balance of presence and smoothness. It’s not prone to harshness or sibilance and, like that of the SD-2, is less bright than average but not lacking in extension. As with the SD-2, I would not mind slightly more energy in the upper midrange and treble, but I also love the forgiving nature of the SD-3. The presentation of the SD-3 is very similar to that of the SD-2 – above average in size and with excellent soundstage width and depth. It lacks the layering and 3-D imaging of the pricier FitEar TG334, as well as top-tier customs such as the UM Miracle, but still provides satisfying imaging. The two StageDiver models share a very strong family resemblance – in fact, it’s tough to pick the better earphone between the two of them. The triple-driver SD-3 offers more bass presence, which is especially noticeable in the subbass region. Its bass is extremely deep and provides some of the best impact I’ve heard from a universal-fit BA earphone without giving up any bass quality to the SD-2. The SD-2, in comparison, has less punch, as well as less rumble and power. As a result of the added bass presence, the SD-3 sounds a little warmer overall. The SD-2, on the other hand, appears a touch clearer and more neutral. Its presentation is less thick and full-bodied compared to the SD-3 but I found its balance to produce a more natural sound. Tonally, the SD-2 is a little brighter due to its lack of bass bias. The soundstages of the two earphones are very similar with the SD-3 sometimes sounding a little more forward and aggressive thanks to its bass emphasis and slightly more present lower mids. The quad-armature UE is a very capable earphone with excellent top-to-bottom extension and an energetic but non-fatiguing sound. The SD-3, in comparison, has quite a lot more bass impact, though the UE900 can keep up in bass depth/extension. The SD-3 also has mids that are a little more prominent and level overall while the UE900 has less presence in the upper midrange. The top end of the UE900 gains presence again and on the whole the UE earphones sound brighter than the StageDiver 3. The SD-3, on the other hand, is smoother and sounds more natural overall despite its enhanced bass. A triple-armature monitor with enhanced bass, the SM64 is one of very few BA-based earphones that can best the SD-3 in bass quantity. It has a little more subbass presence with more rumble compared to the SD-3, which also makes the EarSonics a little warmer tonally. The midrange of the SM64 is “sweet”, but thinner in comparison. The EarSonics have no advantage in clarity, though – in fact, the SD-3 oftentimes provided a slightly clearer sound. The StageDiver is also smoother in the treble region and lacks the upper midrange dip of the SM64. Overall, the SD-3 sounded more neutral to me but lacked some of the “fun” factor of the EarSonics—it definitely has more of a conventional warmer/darker signature while the SM64 is very unique, and it’s very difficult to pick a winner between the two. While it uses a dual-driver setup, the Phonak PFE 232 produces plenty of bass and makes a natural competitor for the similarly-priced SD-3. Bass impact between the two earphones is similar – both feature enhanced bass that is definitely on the heavy side for BA earphones. The PFE 232 has more recessed mids, however, and its treble sounds hotter and sharper. The smoother SD-3 sounded more natural to me, making the tone of the PFE 232 seem rather metallic in comparison. Both earphones boast similarly spacious presentations but overall, the SD-3 sounds more realistic compared to the PFE 232, especially in the midrange and treble. Value (8/10) – Turning up the bass on the less expensive StageDiver 2 model, the InEar StageDiver 3 makes a compelling case for itself as one of the few balanced-armature earphones well-suited for fans of hard-hitting lows. The midrange and treble of the SD-3 strike a good balance between energy and smoothness and the overall value is reinforced with stellar build quality that rivals high-end custom IEMs. The only reservations when it comes to the StageDiver 3 are the tight fit in smaller ears and the less expensive but equally capable SD-2 model, which differs only in sound signature. hi, I’ve been robbed my inear sd3, so i want to buy something similar but an upgraded but with similar price, i think ie80s, custom art fibae 3, EarSonics es3, i buy my inear cuz i read your review, so i believe in your answer, equal or better sound but in 2018, equal or 100 dolar more tha sd3. thanks. using nwz-a15 as source, even using sony’s clearaudio+ at times. enjoying the bass, sub bass, warmth sound stage on ie80s. Probably not, the SD-3 doesn’t have the wide soundstage of the IE80 and I don’t think the bass is any better (the IE8/IE80 have pretty awesome bass). So, are there any models, be it ciem or universals, that you would recommend ? I don’t really go for bass-heavy earphones too much. Maybe the Sony XBA-Z5? It has too much bass for me, but can’t fault it on bass depth, warmth, or soundstaging. I don’t think the GX-4b has an advantage in soundstaging over the SD-3 as they are both stage monitors with similarly forward presentations, so it’s just here for completeness. The Velvet and XBA-Z5 are more spacious. I have both the IE80/800 but I think the bass on the SD3 is more tight and controlled. It us however hard to compare DD versus Armature drivers. Even the bass on the SD2 is hard hitting when listening to bass guitar driven prog rock like Primus. The Sennheisers have the bigger soundstage. Thanks for the answer. I looked up and find the Live Pro 3 version for me. I have a friend who got a Stagediver 3 as gift. She says it sits good in the ear, but she thinks there too much heights and less bass than her Shure SE 215. How this can be? This was the reason about the bi-flanges. Sounds like a bad seal b/ween earphone and ear. The fit of in-ears is a really personal thing, so what works for me definitely won’t work for everyone, but hopefully she can find tips that provide an airtight and sufficiently deep seal. Also, the SE215 does have enhanced bass and rolled-off treble so it’s possible the SD-3 is *slightly* less bassy and not as rolled-off at the top, though it should still be very smooth. Nice review of the Stagediver 3. But my right ear allows only custom one, cause of operations. Is there a comparison with something like Aurisonics ASG 2/2.5? How is the sound with MEElec M6 bi-flanges you mentioned? Which tips are there also? I’ve haven’t tried an Aurisonics product since the ASG 1.1 or 1.2, so I can’t provide that comparison. I forget the exact model number but I think you can get a custom SD-3 from InEar. The SD-3 isn’t particularly tip-sensitive but I can get a more consistent seal with the bi-flanges than the stock singles, which makes them valuable. I still think the regular stock tips have slightly better bass impact, but the SD-3 doesn’t need any help in that regard.